Can I Lift and Rotate My Product at High Speeds? Meeting efficiency demands for your client’s pallet conveyor automation system project often means seeking ways to cut down steps in the automation process or reduce the time it takes to complete those steps. The servo-driven Lift and Rotate Unit from Glide-Line can help do both. The servo motor generates both faster velocity and more control of the rotation, enabling you to use it within your automation conveyor system with relative ease wherever you need to lift and rotate products. Additionally, the LRU is programmable to stop at any angle, which helps cut down additional processes needed for visual inspection or angling in a more traditional system. The LRU’s flexibility helps meet efficiency needs while maintaining product control. “How fast can you rotate my product?” This is often the first question engineers ask when considering the LRU for their automation systems. The quick answer: we can very likely rotate the pallet faster than the pallet or the product can handle. Any speed you’d like to accomplish without disruption to the product, the Lift & Rotate Unit can achieve. 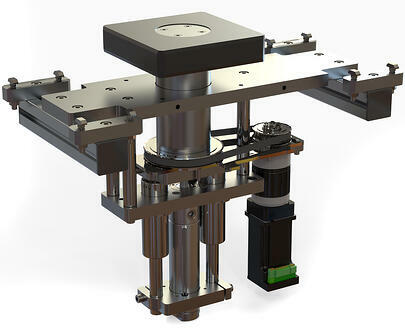 And, if our standard step-servo needs to be resized to accommodate a larger product or pallet, we’re able to do that. Servo-based motors can achieve greater velocity than pneumatic-based motors, since they have an inherently higher RPM. But more importantly, a servo will include controlled acceleration and deceleration. A servo will include controlled acceleration and deceleration. When considering the Lift & Rotate Unit as a visual presentation solution, the important thing to remember is the LRU has the ability to keep the product on the line, thanks to the control offered by the servo-driven motors. And inspections can be accomplished on the pallet conveyor without having to manually inspect the product away from the station. Rotational movement using a pneumatically-driven motor can have the unfortunate effect of disrupting products on a pallet, since it’s difficult - if not impossible - to control the acceleration and deceleration of the actuator. On the other hand, an electric servo-driven motor, like the one used in Glide-Line’s Lift & Rotate Unit, controls the speed at which the pallet starts, stops, and rotates. You client will have more flexibility, control, and options when it comes to the speed of the rotation with the LRU. Precision programming means consistent accuracy in the motion of the pallet rotation, and by extension, the product on the pallet. Achieve faster speeds with better control and improved efficiency using the Lift & Rotate Unit from Glide-Line. 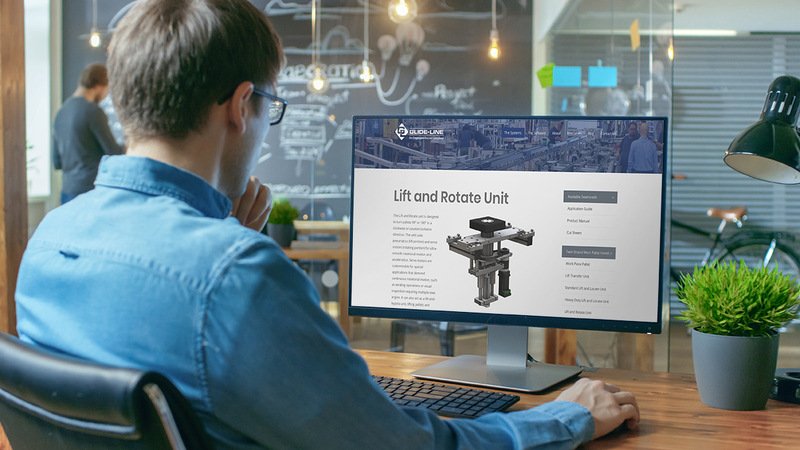 Read more in our ebook, Thinking Differently: The Guide To Creatively Lift & Rotate Products in your Assembly Automation System.